36 Summer 2018 PracticeLink.com T e c h N o T e s You already love the Northwest. Why not love your career, too? 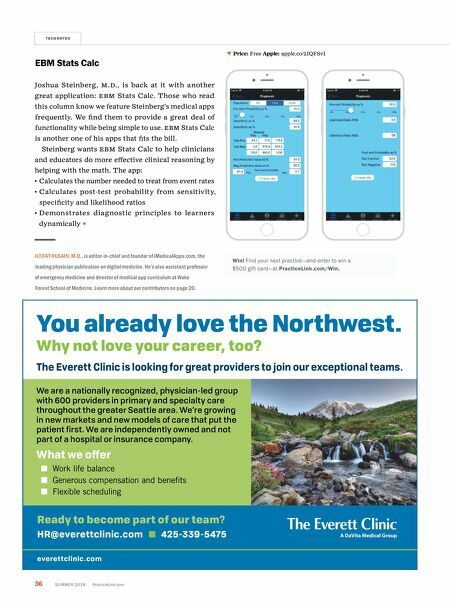 everettclinic.com Ready to become part of our team? 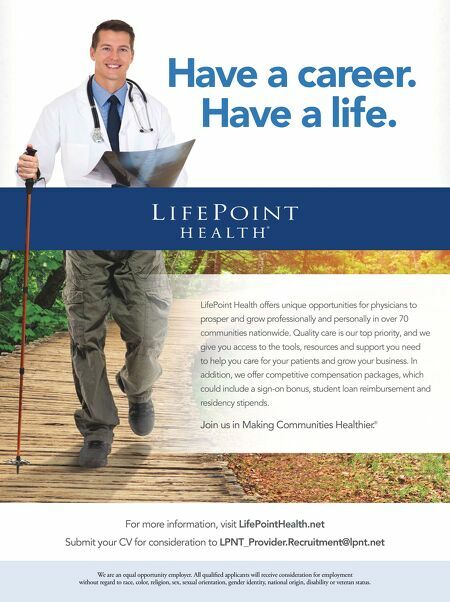 HR@everettclinic.com n 425-339-5475 The Everett Clinic is looking for great providers to join our exceptional teams. We are a nationally recognized, physician-led group with 600 providers in primary and specialty care throughout the greater Seattle area. We're growing in new markets and new models of care that put the patient first. We are independently owned and not part of a hospital or insurance company. What we offer n Work life balance n Generous compensation and benefits n Flexible scheduling EBM Stats Calc Joshua Steinberg, M.D., is back at it with another great application: EBM Stats Calc. Those who read this column know we feature Steinberg's medical apps frequently. We find them to provide a great deal of functionality while being simple to use. EBM Stats Calc is another one of his apps that fits the bill. Steinberg wants EBM Stats Calc to help clinicians and educators do more effective clinical reasoning by helping with the math. The app: • Calculates the number needed to treat from event rates • Calculates post-test probability from sensitivity, specificity and likelihood ratios • Demonstrates diagnostic principles to learners dynamically ILTIFAT HUSAIN, M.D., is editor-in-chief and founder of iMedicalApps.com, the leading physician publication on digital medicine. He's also assistant professor of emergency medicine and director of medical app curriculum at Wake Forest School of Medicine. Learn more about our contributors on page 20. q Price: Free Apple: apple.co/2IQFSvI Win! Find your next practice—and enter to win a $500 gift card—at PracticeLink.com/Win.